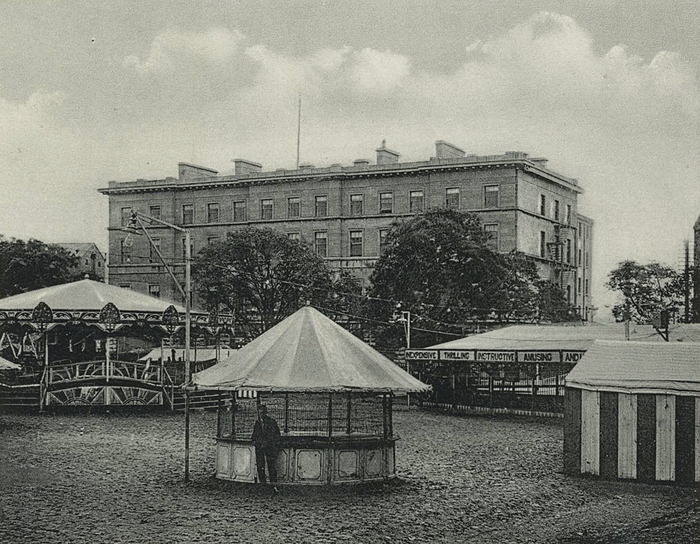 The Toft family were associated with Eyre Square for many years since 1883 when they first brought a carnival there. Abby Toft, a Dubliner, ran the amusements through the early years. He married Florence Piper from Tramore and they had three children, Claude, Kenneth and Maureen. Kenneth joined the RAF during World War II and his plane was shot down over Germany. He parachuted to safety but was captured and spent the rest of the war in a POW camp. He came home after the war, and by way of celebration, his mother built the amusement arcade in Salthill for him. Claude was born on April 10, 1922. During the late 1940s, he followed the family tradition by building his own amusement arcade in Salthill. He was a director of Galway Rovers AFC and in 1981 he suggested they change the name to Galway United AFC. It was his father who initiated the Prom Swim competitions in 1934 and Claude, who was very involved with Galway Swimming Club, continued to sponsor the race, as do his family to this day. Claude was elected Mayor of Galway but sadly died while in office. For many years Tofts brought their amusement park to Eyre Square for part of the summer, especially during Race Week. They were always noted for their generosity, the last two days earnings of each week were donated to charity. They used to put up a bull as a prize for a raffle on the last race night which attracted a lot of rural people, and again, the proceeds went to charity. The Vincent de Paul often had a stall with prizes donated by local businesses. Parents felt secure as the park was surrounded by railings, making it relatively safe for children while giving them a certain freedom. At night in particular, there was a festive atmosphere with flashing lights, ‘fairground music’, people calling out the attractions of the various stalls, screams and whoops of delight. The big wheel, aka the Big Dipper, was usually in the centre surrounded by a dazzling array of hurdy-gurdies, chair-o-planes, ghost trains, the wheel of fortune, a merry-go-round, slides, the rifle range, the coconut shy, the carousel which had beautiful hand carved hobby horses, swing boats, the helter-skelter, the waltzer, skittles, the octopus etc. The Dodgem Track, better known as the bumpers, was probably the most popular of them all, though not with my dad. On the first and only occasion where he put me behind the wheel and told me to go for it, it seemed like he was fated to have all of his teeth knocked out. Do you remember the Wall of Death motorcyclists who passed within inches of each other while going in different directions, or the man who dived from a 50 foot platform into a small tank of water, the top of which was set alight with oil? The term ‘Funfair’ was apt, though you needed money as well. It was a good idea to do a tour looking at all the attractions before you spent your cash, otherwise you invariably came across what could have been the highlight of the evening when you were broke. The Old Galway Society is hosting a lecture this evening in the Victoria Hotel at 7.30pm. The title is “My Father My Son” and it will be given by Ultan Macken on the subject of his dad, Walter Macken. All are welcome.